Michael Neale is a development manager at CloudBees and an open source polyglot developer. For his sins, he spent time at JBoss, working on the Drools project and then Red Hat, where he continually caused trouble on various projects. Michael was one of the co-founders of CloudBees, seeing great opportunity in cloud technologies. In this post I wanted to cover the why and some of the how of shipping apps to a Kubernetes cluster from CodeShip. 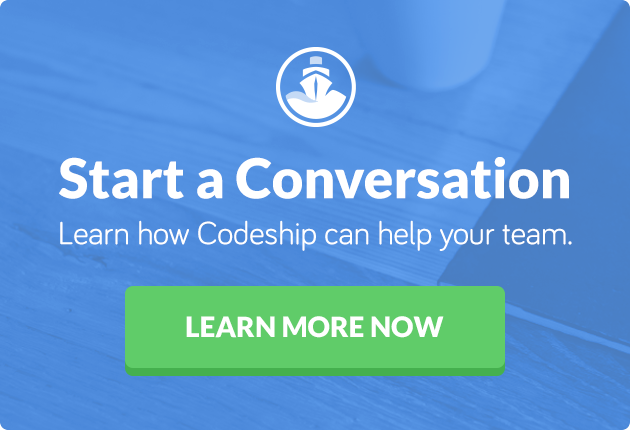 So let’s say you have a Kubernetes cluster, and you want to make good use of it, so why CodeShip? Well obviously the number one reason is to stay within the realms of nautical themes and puns. That is clearly an important factor in choosing a technology. There are other reasons however, the CodeShip Pro platform is a flexible hosted service, which is Docker native. What this means is that you can offload your CI/CD pipeline work (build and test), Docker image building and publishing to an elastic on-demand service. This frees up your Kubernetes cluster to cope with the production workload. If you are using Kubernetes as your application platform, then the unit of deployment, the artifact, is a published Docker image, which is a great fit for CodeShip. I like to describe CI/CD workloads (particular building and executing of tests) as “pathological.” You are checking out, building (if it is a compiled language — compilers can be very CPU/IO heavy, dependency management is IO and network heavy for even non-compiled languages), and then testing essentially arbitrary code. You have caches to manage, and tests that leave garbage around, files and processes everywhere. Basically the result after any build is like the day after a party. It makes sense to containerize or virtualize that stuff away as much as possible. CodeShip Pro actually uses disposable VMs for each build run, there is no state to be shared between steps. Both Docker and Kubernetes are changing often (in good ways) and anything you can do to make coping with change “someone else’s problem” is great in my books (laziness is a virtue here), and this is where CodeShip can shine. In a given Kubernetes setup, there can be challenges in accessing the lower layers to build Docker images, publish images, depending on permissions. Things can be made a lot simpler if you think about deploying prebuilt images; in this case, the “prebuilt” images are coming from CodeShip. Building Docker images on a Kubernetes cluster is a maturing story. Thanks to the Kaniko open source tool from Google requiring fewer permissions, there are still challenges in doing this in a way that applies widely to all configurations. The multi-tenancy model in Kubernetes is still an evolving story, and often the best bet is to have the building and image preparation run with VM grade isolation, which is exactly what you get for CodeShip (in a pay-for-what-you-use model). However when things heat up, what would you prioritize: building changes/fixes or the production workloads? This is a super tough question, as increasingly running CI/CD workloads are production, but in many cases people would prioritize running user facing production and making pipelines wait. If you can offload your image building/testing to CodeShip then you can kind of have the best of both worlds. I am grossly oversimplifying (there will be links later for the real blow-by-blow instructions), but at its heart, changing the state of a cluster to get a new version of your app (Docker image) can be something like that, very automation friendly. It works as Kubernetes deployments are declarative: Kubernetes is responsible in taking action to update the cluster. Generally this helps with zero downtime upgrades, as the changes are rolled out, and the new services don’t take the load until they are ready. CodeShip Pro has a bunch of premade images as tools (it is extensible via images), for example codeship/google-cloud-deployment and codeship/aws-deployment, which have the tools needed ready to go. There are other files of course, for example you would have encrypted secrets that give access to your Kubernetes environment from the running pipeline (CodeShip will encrypt them for you) and you put them all alongside your code. This specific example was for Google’s Kubernetes service (it is very similar for Amazon and other services). CodeShip knows about Docker registries (and how to publish to each of them), so the first “step” is about publishing. This will happen on every change, and it uses the timestamp to give a unique image tag. The second step does the deployment, but only when the change is merged to the master branch. The details of the deployment are encapsulated in the deploy.sh script. The example above was adapted from a free mini-book you can download – this is Google Kubernetes Service specific but covers things in more detail than here. You can read a lot more technical documentation here on driving Kubernetes and kubectl from CodeShip, with instructions specific to Azure, AWS, Google and IBM Blue Mix. You focus on making changes to your app, testing them locally, and then testing them via steps in codeship-step.yml, and once happy, a merge to a master branch will trigger a deployment and update of the cluster. Run this command in the directory where your code and config is, and it runs the same steps that would run on the server. This lets you iterate fast when debugging. You can even perform deployments this way if you have to (obviously it is better letting CodeShip do this based on triggers from the SCM, so you have an audit trail of changes), but it can be done if needed.